A Notepad can make a wonderful promotional item for any one who is working from a strict budget. We print and design notepads in several different sizes, shapes and colors. Depending on how much money you want to spend in notepad printing, you can make plain notepads with your name and company logo on it, offered as fine gifts for clients. Low Price: S S Graphics offer the finest notepad printing services at affordable prices. Professional Printing services: S S Graphics offer a professional notepad printing service. On Time Deliveries: We deliver the printing projects on the specified time. Notepad printing is a cost-effective way to promote your business. At S S Graphics , we offer premium quality notepad printing service. Our notepad printing includes full color and back side blank printing. We thank you for visiting our "Notepad" section. Our years of experience in the printing industry only affirm that we can be a genuine choice when it comes to high quality notepad printing. 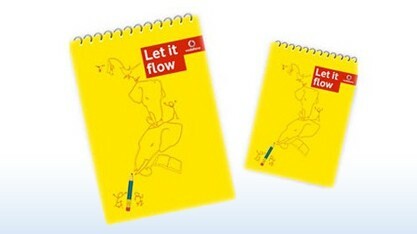 Notepads are an awesome and inexpensive marketing and corporate identity reinforcing tool. Every time they write a note they will be looking at your logo and contact information! And whenever they are ready to place an order they will have your information right on their desktop so it is a great way of keeping your company information in front of them at all times. Unlike other marketing pieces that end up in the trash bin, notepads are used for note-writing until they are gone. Sizes of the Notepads may be customised to make them small enough to fit in a purse or big enough for briefcase. Notepads should definitely include your logo and any basic contact information but you should always make sure when designing notepads not to include too much information. The design should be clean and attractive.